Reading and share top 2 famous quotes and sayings about Rejecting Change by famous authors and people. Browse top 2 famous quotes and sayings about Rejecting Change by most favorite authors. 1. 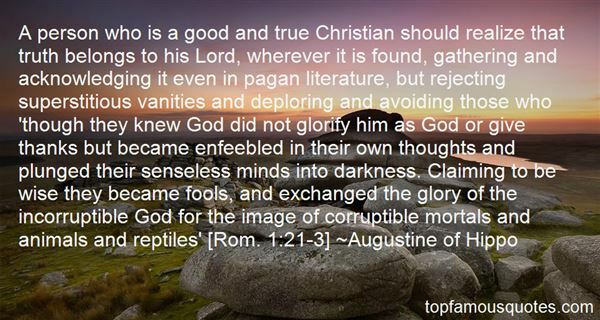 "A person who is a good and true Christian should realize that truth belongs to his Lord, wherever it is found, gathering and acknowledging it even in pagan literature, but rejecting superstitious vanities and deploring and avoiding those who 'though they knew God did not glorify him as God or give thanks but became enfeebled in their own thoughts and plunged their senseless minds into darkness. Claiming to be wise they became fools, and exchanged the glory of the incorruptible God for the image of corruptible mortals and animals and reptiles' [Rom. 1:21-3]"
2. "Those who don't love themselves as they are rarely love life as it is either. 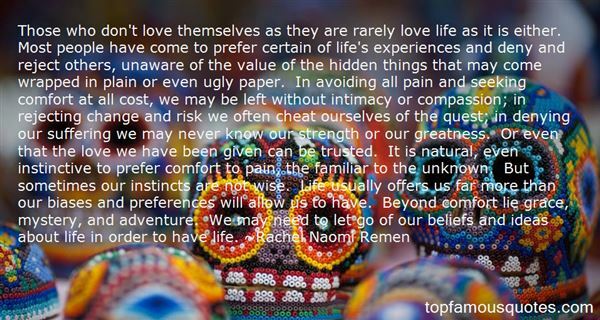 Most people have come to prefer certain of life's experiences and deny and reject others, unaware of the value of the hidden things that may come wrapped in plain or even ugly paper. In avoiding all pain and seeking comfort at all cost, we may be left without intimacy or compassion; in rejecting change and risk we often cheat ourselves of the quest; in denying our suffering we may never know our strength or our greatness. Or even that the love we have been given can be trusted. It is natural, even instinctive to prefer comfort to pain, the familiar to the unknown. But sometimes our instincts are not wise. Life usually offers us far more than our biases and preferences will allow us to have. Beyond comfort lie grace, mystery, and adventure. We may need to let go of our beliefs and ideas about life in order to have life." True love is when you put someone else's life before yours."